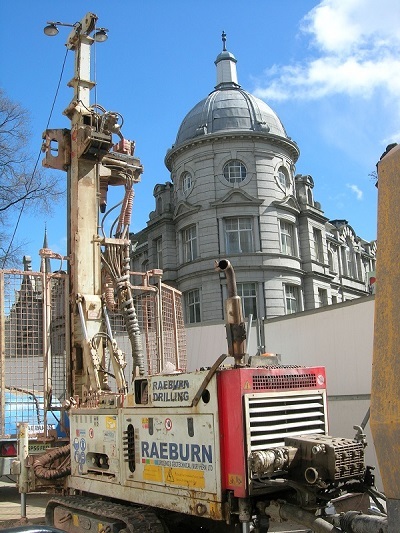 Raeburn Drilling and Geotechnical (Northern) Limited carried out a ground investigation at the Aberdeen Art Gallery, Schoolhill in Aberdeen. The purpose of the investigation was to establish the ground conditions underlying the site; investigate the nature and depth of the of the existing foundations; to assess the need for and type of new foundations and to install gas and groundwater monitoring equipment in selected boreholes. all with a view to refurbish and redevelop the Gallery. It is proposed to refurbish and redevelop the Gallery requiring repair and/or strengthening of the structure, demolition of the north office extension building, extension of the existing basement and construction of a new extension and foundations, demolition of areas of existing roof to allow for construction of a new storey over the main gallery building footprint and associated wall.